Jon and Kathy are elated to be finishing school for Christmas break. Distracted Jon knocks over a girl as they head to the cycle rack. Kathy is suspicious of a new schoolgirl on the last day of term but as they ride off they don't notice that the girl has been monitoring Jon. As the two kids head home Jon asks if Kathy would like to take the shortcut across Dead Man's Swamp. He wants to find a Christmas tree for the Smith Farm but Kathy declines heading home. With Jon alone he removes his disguise heading around the swamp on foot. First an owl then a snake and finally a moose scare Jon into losing control with his heat vision. Out of nowhere Nobody and Goliath grab the Boy of Steel and hover in the sky. Nobody scans emergency services and finds that Jon's heat vision has alerted them but at that same time Goliath's flurry coat causes Jon's freeze breath to be unleashed for the first time. Before they plummet to their deaths Goliath grabs them for a less than graceful landing. When Jon wakes up he's covered head to toe in medical sensors and finds that Damien Wayne, the infamous Robin is running tests on him. Damian reveals he's been watching Jon for a while and knows all about him and his fluctuating powers. He is angry that the League seems to have embraced him so openly without earning the privilege. 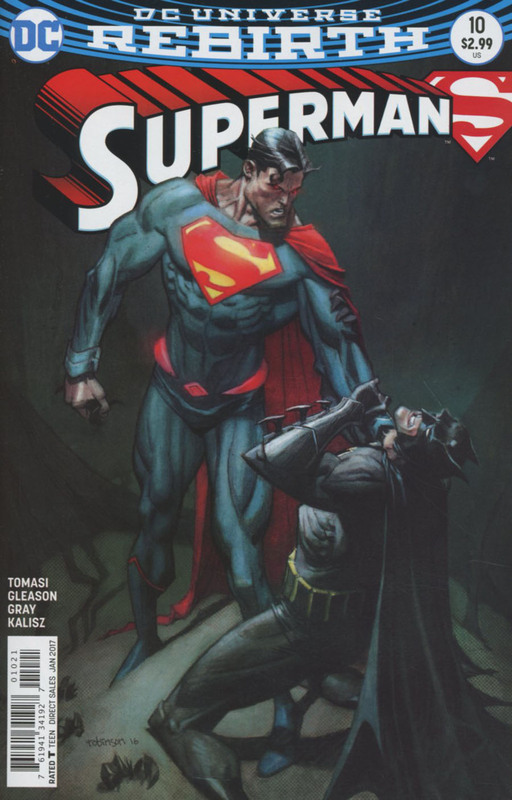 Batman appears and warns them to release Jon but it comes too late as Superman arrives seething with anger. 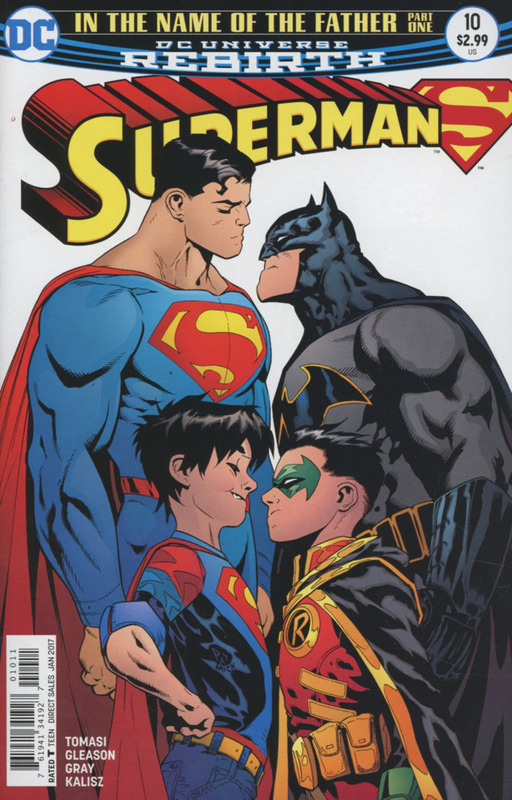 Jon asks his dad to stand down but Clark ignores him telling Bruce to control his child. Batman produces a kryptonite batarang but Jon separates everyone with a wall of ice. Jon surprises his Dad with his new power and calm sets in. Clark apologizes to Jon for allowing himself to get so angry and laments missing this milestone. Damian angrily complains that the freezing ruined his equipment and Bruce comments that he sympathizes with Clark because he missed a lot of Damian's 'first steps' and regrets that too. Clark notices a cloaked Nobody in the cave and she reappears as the girl from Jon's school. With no more secrets they all make peace with Goliath and Nobody leaving the two families to bond. Batman checks Damian's data and notices abnormalities. The Fortress computers may have completed Kryptonian tests but the Batcave can test the human data. Bruce tells Clark that the fluctuations will definitely manifest new powers but what they might be is unclear. In the meantime a reluctant Damian introduces Jon to his family of pets. Jon suggests bringing them to the Smith Farm but an off comment about killing pets starts a fight amongst the boys. Their fight escalates until it grabs the attention of their fathers and with two angry parents comes discipline. Story - 5: I'm not familiar with Nobody and Goliath and though they serve a purpose, I'm not sure they added anything to the story. I'll be honest, admitting I really don't have time for Damian Wayne, he's brash, impulsive and rude. However, until now, he hasn't had a polar opposite to bring him into balance. He is very much his father's son and as such you can see very quickly that, like Bruce Wayne, he needs a 'someone' to bounce off of. Everyone acted just as I thought they would but I also hoped the conflict would have more of a longstanding effect and change the dynamic between Clark and Bruce. That didn't happen, but the next chapter promises to have the World's Finest deliver some tough parenting of their unruly children. The closest to children I have is my dog but I'm sure I too would have acted much the same with another dog and his owner. All 10 issues thus far have been comics gold, I hope they continue for a long time to come! With a duplicate of the 'World's Finest' something has to change but the anticipation is a positive feeling and let's see where Superman and Superboy go from here! Art - 4: Patrick Gleason takes on the art chores once more. The action sequences really buzz with energy and though it lacks the powerful details we saw in the last arc they are still vibrant enough to captivate. Cover Art - 4: A face off that feels a little light hearted. I would have liked a more serious take but it is in character and in keeping with the story. I suppose sometimes in the dark we do occasionally need some light but maybe without the comedic touch next time? Variant Cover Art - 5: Two fathers defending their children, one colossal cover. Andrew Robinson gives us a Batman v Superman showdown I really get a kick out of. These series of variants are really fun and look great!